It's been a while, more than a month! I will say it - I can't believe it's been that long. First it was the winter vacation, most of which we were away. Then I took a week to finish a project I had lying around. Then I worked on this e-pattern. Then... last week just flew by with doctor and dentist appointments. Then... a stomach flu. Then... it's Jan 25. But we are back, and trying to stay on track - one/two weeks for a new garment. 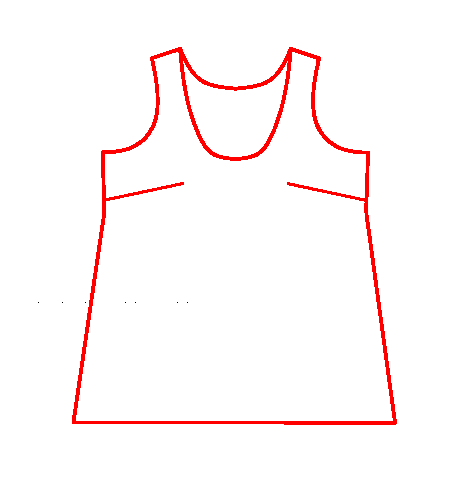 This week we are not really going to be making a new garment - it will be the basic sleeveless top already made in Week 4. However I will use the e-pattern I posted last week: the block I will be using to make the next few designs. You can read about it and download it here. 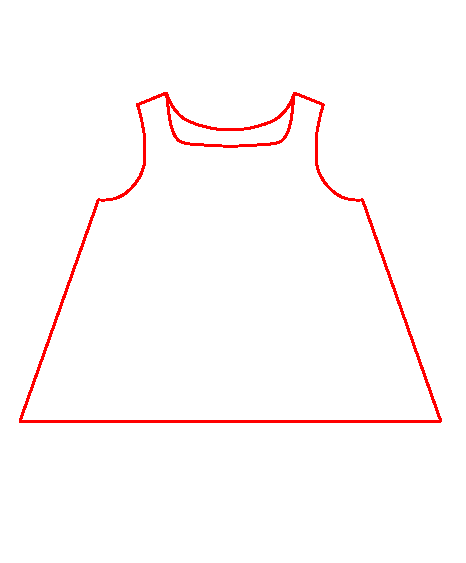 Therefore, it will basically be the same top, except that it will be easier to make because I will not be starting from the basic sloper, I will be starting from a block I designed myself, and therefore there will be less steps to get to the final design. The best thing is that now you can download that block, follow the instruction here and sew a top like this for yourself. 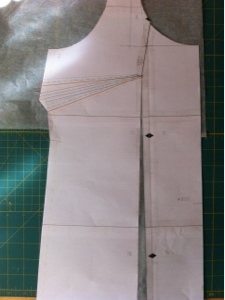 The block comes in sizes 36 - 42 (based on burda sizes; see the size chart). This is what the pattern looks like when it is printed and assembled. You can of course print it black/white because the pattern lines are different so you will be able to figure out which size is which. 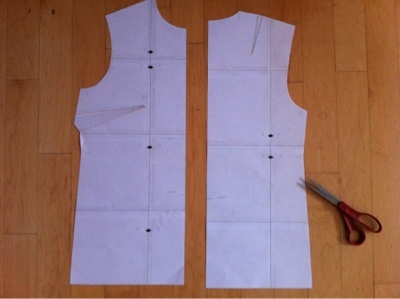 If you compare these pattern pieces with those of the finished basic sleeveless top - you could see that they are very similar. The biggest difference are the arm and neck openings, and that's what we are going to be changing to get this and some other designs. 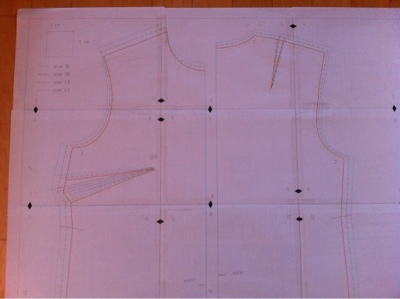 To start, redraw the new neckline and arm opening. 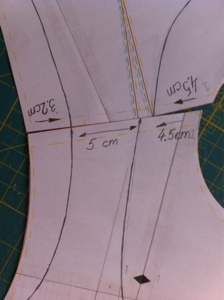 I used the same measurements as before: 4.5 cm from the neckline down the shoulder seam (both front and back); 5 cm shoulder width. In the back you will notice I did not measure 5 cm for the shoulder - because of the dart - instead I measured from the arm opening, 3.2 cm to match the same measurement in the front. The front neck opening is 13.5 cm deep; back neck is 6 cm. Before I cut those out, I need to check if the curves are smooth across the neck and arm openings. Align the pattern pieces as in the pics above: as you can see - the arm curve is nice and smooth, but the neck curve needs to be fixed a little, it is not smooth across the shoulder seam. Now you are ready to cut along those lines. Next, we need to fix the neck opening a little: because this is a deep opening, it will not lay flat on your chest. 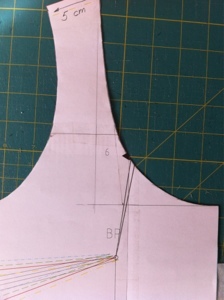 So we need to tightened it a bit, which will bring the shoulder seam closer to the neck. If you choose to make a smaller opening you might not have to do this. It is hard to say what is the deep neckline and what is not, or whether you need this or not. The best thing is just to try on your muslin. 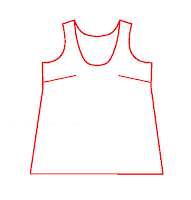 One note - if you are making a sleeveless top, like this one, tightening your neckline will not matter much, because there are no sleeves to be pulled up as the shoulder are pulled closer to the neck, so you can do it, even if your neckline is not as deep as this one. There are a few options as to where to "move" that "dart". 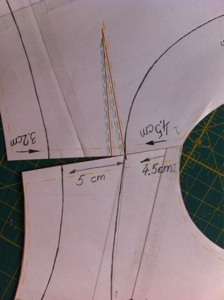 In this case I chose to add a bit volume at the bottom, make it even more A-line, so I moved the dart towards the hem. So I drew a line perpendicular to hem from BP. 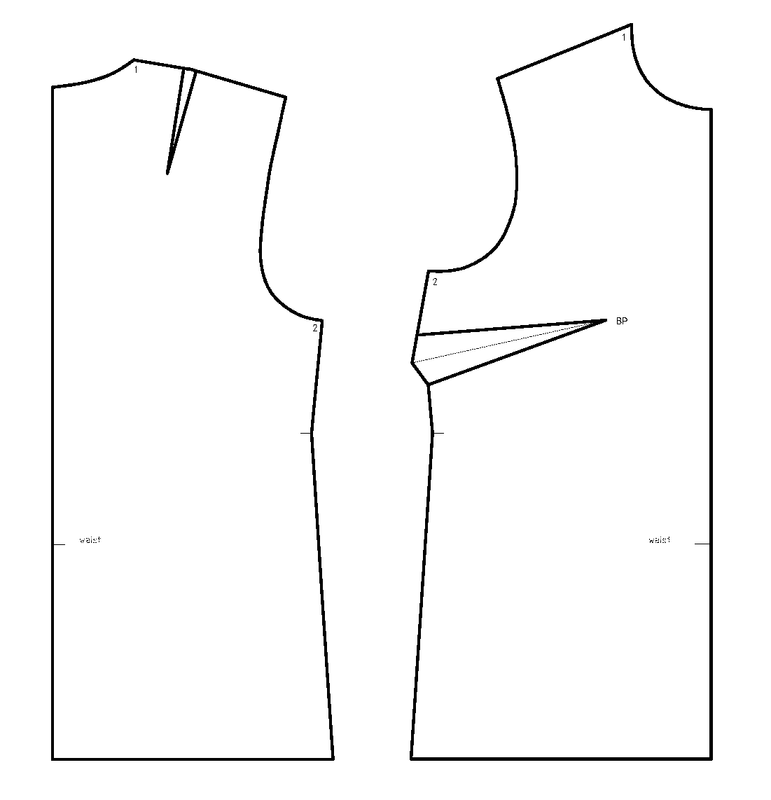 Then cut the dart out and then cut along the line from hem to BP, but don't cut through BP, stop just before so that the two pieces don't separate. Close the dart and open at the hem, just like above. Tape the closed dart together and tape some paper under the open part to stabilize the pattern - you could leave it open but you would have hard time transferring it to your fabric. The front is almost done - the last thing is to smooth the neckline, if you need. Depending on your curve, when you close the dart you might need to redraw it slightly. Finally the back... The only thing to do is to take care of that shoulder dart. Again, there are a few options, and I will show some in future projects. 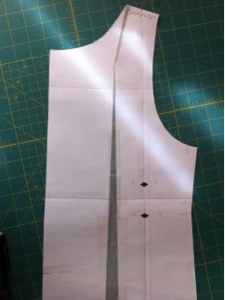 But in this one I decided to move it into the hemline, to add some volume, just line in the front piece. So, again, draw a line straight down to hem from the tip of the dart. Then cut the dart out and cut along the line from the hem to, but not through, the tip of the dart. We will not move/close the whole dart because this will add too much volume to the bottom, and that would not match the front. 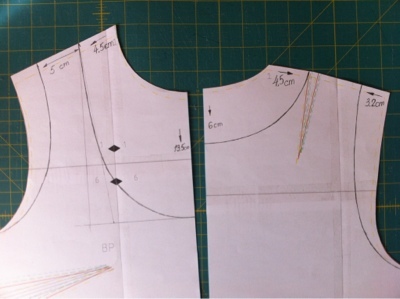 So I measured the amount added in the front by moving the neckline dart - it was about 2 cm, and opened the back about the same amount (so that the opening measured at the hem is about the same). This means that the shoulder dart will not be completely closed. And that's OK. The little bit extra will not be a problem - I will just do a little ease... Put some paper under your pattern and tape down.